This machine gun gave an American Infantry Company the heavy firepower to mown down enemy infantry trying to attack their position. It fired 600 rounds a minute feed by a 250 round belt. It weighed 14 kilograms and had a effective range of 1,400 metres. It needed a two man to operate it. Five million were built and it was heavily used during the Second World War and the Korean War. It went to be used during the Vietnam War. 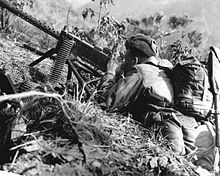 The Browning machine gun in use in Korea.